(CNN) -- Pakistan paceman Shoaib Akhtar looks set to miss next month's World Twenty20 after receiving treatment for a genital infection. Shoaib's infection is the latest in a long line of controversial incidents that have plagued the paceman. Shoaib was named in the initial 15-man squad for the tournament, which takes place in England from June 5, but the Pakistan Cricket Board has announced they had applied for a replacement to the ICC technical committee. The 33-year-old pace bowler, whose participation had been in doubt after he struggled for fitness and form during the recent one-day series against Australia, was diagnosed with genital viral warts and underwent a course of electrofulgration treatment -- a procedure where electrical current is used to destroy unwanted tissue. "The medical board has reported that Shoaib Akhtar was suffering from genital viral warts and the wound needs further care and treatment for a minimum 10 days for the purpose of healing and to achieve skin cover," PCB said in a statement. A three-man medical team convened by the PCB -- consisting of consultant surgeon Javed Raza Gardezi, dermatologist Dr Ijaz Hussain and PCB doctor Riaz Ahmed -- advised that Shoaib could be reassessed on June 1. The rest of the squad will already be in England by then, with the team's first warm-up match scheduled for the same day, when they will meet South Africa at Trent Bridge. The news is the latest embarrassing moment in the controversial career of the paceman, known as the 'Rawalpindi Express'. 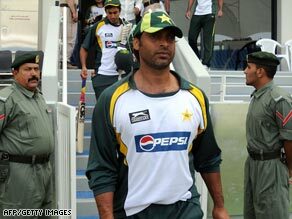 Shoaib's various misdemeanors include being banned for five matches after hitting team-mate Mohammad Asif with a bat in 2007 and testing positive for performance-enhancing drug nandrolone in 2006. Meanwhile, the opening match of England's NatWest one-day series against West Indies at Headingley, Leeds, was abandoned without a ball being bowled because of rain.